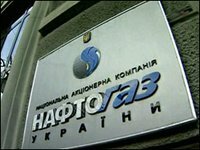 National joint-stock company Naftogaz Ukrainy, after signing a supplementary agreement to a contract with Russia's OJSC Gazprom on December 17, 2013 on the reduction of the price of gas to $268.50 per 1,000 cubic meters from January 1, 2014, has cut gas imports to the minimum. According to tentative data of the Central Dispatching Department of the Fuel and Energy Complex (CDU TEK), while in the first ten days of December imports of Russian gas by the state holding stood at 100 million cubic meters a day, from December 11 to December 17 this had fallen to 81 million cubic meters a day, and from December 18 to December 21 it fell to 32.8 million cubic meters a day. On December 18, 44.5 million cubic meters of gas was imported, 33.7 million cubic meters on December 19, 25.1 million cubic meters of gas on December 20 and 27.7 million cubic meters of gas on December 21. From December 1 to December 21, Naftogaz Ukrainy bought 1.698 billion cubic meters of gas from Gazprom. Reverse gas purchases of gas from Hungary slightly grew from the start of the period of the last ten days of December and from Poland they did not change. According to FGSZ Ltd., the operator of the Hungarian gas transport system, imports of gas grew from average daily 3.2 million cubic meters (on December 1-15) to 3.5 million cubic meters (on December 16-19) and 4.1 million cubic meters (on December 20-21). According to Gaz-System S.A., imports from Poland from December 12 to December 21 were stable – 1.3 million cubic meters of gas a day. In the first ten days of December Ukraine almost did not import gas from Poland.